Many in the legal profession, or even lay people, have heard of a situation where one party is unable to locate the other in an effort to begin court proceedings. Over time, it has also become a common occurrence to hear a situation where although one is unable to locate an individual or contact them by ordinary means, one is aware they are contactable and active on social media. A question that courts are asking due to this societal shift in communication, is whether making service via social media a valid and sufficient means of service. Many courts have come by this issue, but recently a New York court made a decision. In a New York court where an ex-husband was trying to make service to his ex-wife in order to begin court proceedings involving custody of their son, the ex-husband and his attorney failed in their attempts. The last known address was now being occupied by the ex-wife’s sister and she refused to disclose any information regarding her sister’s whereabouts. Despite the failure in reaching service by standard mail, the ex-husband was able to find information and make contact through Facebook. The attorney subsequently requested the court to allow service to be done through Facebook. Due to the judge’s hesitation to the newness of this issue and whether this type of service met the standard of service required, he granted the service to be made through Facebook, but on the condition that service via standard mail still be attempted at the last known address. Although the court’s holding did not allow social media as the sole method to establish sufficient service, there was definite progress made. The plaintiff was able to continue his attempt in service via mail but was able to start his court proceedings due to the communications made through Facebook. This decision, if adopted by other courts, will allow others in this similar situation to not be held back form their court proceedings simply due to a lack of service. The court did bring up a valid point in hanging their decision contingent on the standard mail service attempt due to the uncertainty that the Facebook account was truly run by the defendant, which could be an issue in later matters. There are many instances where people manage or operate other individuals Facebook and or social media accounts and it is difficult to truly know who is behind the screen. In my opinion, this decision is one that was much needed. There are more and more instances occurring where an individual attempting to start court proceedings is kept in limbo due to a person hiding from having service made. 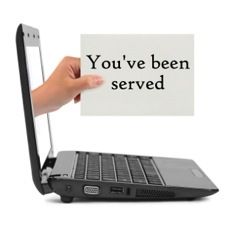 In addition to the defendant hiding from service, they are usually active online and that makes things unfair to the plaintiff. The court also made a good move to require that standard service continue to be attempted due to the unknown identity of the person running the social media site. Although, I believe this issue has not been resolved, and will grow tremendously from here forward, I believe this New York court made a forward-looking decision that will help many plaintiffs who are more and more commonly being avoided by defendants to prevent the start of court proceedings.